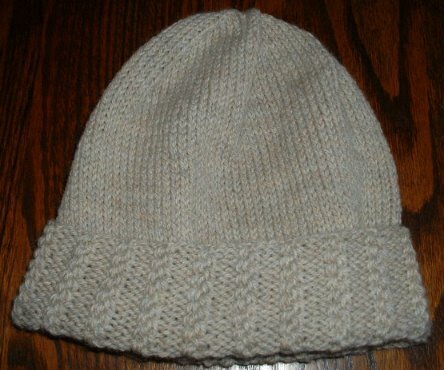 Over the weekend I wanted to knit a watch cap, but I wanted something just a little different, so I studied the Barbara Walker’s Treasury of Knitting Patterns and decided on wheat ear rib for the ribbing portion. It’s pretty, and it made me think of a small wheat field I once saw that was surrounded on three sides by woods. And since one thought generally leads to another, I remembered the skein of natural mix Patons Classic Wool that was left over from my Must-Have cardigan and knew it would be the perfect choice. Fits a medium-sized adult head. Adjustments in size may be made by casting on any number of stitches that are a multiple of 5 +2, then increasing or decreasing a couple of stitches for the body of the hat so that the number of stitches is divisible by 6. Row 1 (right side): *P3, insert needle from back to front between 1st and 2nd stitches on left-hand needle and knit the 2nd st, then knit the 1st st and slip both stitches from the needle together; repeat from *, end p2. Row 2: *K3, skip 1 stitch and purl the 2nd st, then purl the skipped st, then sl both stitches from needle together; rep from *, end K2. Cast on 97 stitches using a circular needle. Work the wheat ear rib pattern back and forth for 3”. At the end of the last wrong-side row, join the knitting so that you will now be knitting in the round. Be sure the wrong side is facing out, so that when the brim is turned up, the right side will show. Purl one round, decreasing one stitch in this round for a total of 96 stitches. Knit around until the whole hat is about 8 inches in length. You may adjust this for a tighter or more roomy cap. Though a watch cap is typically supposed to be close-fitting, I like a little more room up at the very top. A length of 7 ½” is probably enough for most people. Continue in this manner, switching to double points when needed, until there are 48 stitches. Then decrease every round until there are only 6 stitches left. Break yarn and thread through these stitches, pulling tightly and securing on the wrong side. Sew up seam on brim. Thanks, Erin. I love this color, too. Up close you can tell that it's a mix of neutral tones...very pretty. Thank you for sharing the Wheat Ear stitch pattern. It's very pretty! I also like the color of your hat. It's very soothing. And the wool looks very soft. Is it? I've never used Patons classic. Is it similar to Cascade 220? Thanks, Bonnie! I have never used Cascade 220, so I am not sure about that comparison. The Patons is very soft..it's merino. My skin is pretty sensitive, and this doesn't bother me at all. I like the hat. What a great idea! I am glad that you are back to knitting...Sadie is going to wear her sweater when I take her for a walk after work! She feels very feminine and sophisticated in it!